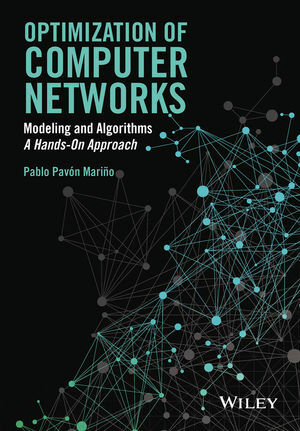 Pablo Pav�n Mariño, Optimization of computer networks. Modeling and algorithms. A hands-on approach , Wiley 2016. Report_delay: This report receives as an input a network design, where the network is assumed to be based on packet switching, and estimates the packet delay of the different flows. Online_evGen_generalGenerator: Generates events to a technology-agnostic network, consisting of connection requests/releases and failures and repairs. Online_evProc_generalProcessor: Implements the reactions of a technology-agnostic network to connection requests under various CAC options, and reactions to failures and repairs under different recovery schemes. Report_availability: This report receives as an input a network design, the network recovery scheme algorithm, and the network risks (SRGs), and estimates the availability of the network (including individual availabilities for each demand), using an enumerative process that also provides an estimation of the estimation error. Report_perSRGFailureAnalysis: This report receives as an input a network design, the network recovery scheme algorithm, and a set of network risks (SRGs), and computes the availability of each network and each demand, in the no-failure state, and in each of the single-SRG failure states. Offline_fa_xteFormulations: Solves severals variants of routing problems in the form of destination-link formulations. Offline_cfa_xpMultiperiodModularCapacities: Finds the multiperiod (e.g. Offline_ca_wirelessPersistenceProbability: Optimizes the persistence probability of the links in a wireless network based on a random-access (ALOHA-type) MAC, solving a formulation. Offline_ca_wirelessCsmaWindowSize: Optimizes the backoff window size of the links in a wireless network based on a CSMA MAC, solving a formulation. Offline_cba_wirelessCongControlTransmissionPowerAssignment: Jointly optimizes the demand injected traffic (congestion control) and link transmission powers ina wireless network, solving a NUM formulation. Offline_ca_wirelessTransmissionPower: Finds a fair allocation of the transmission power in a wireless network, solving a formulation. Offline_ba_numFormulations: Solves the congestion control problem using a NUM formulation. Offline_cba_congControLinkBwSplitTwolQoS: In a network with demands of two QoS, jointly optimizes the demand injected traffic and link capacity assigned to each solving a formulation. Offline_tca_nodeLocation: Solves several variants of node location problem formlations. Offline_tcfa_xdeFormulationsMinLinkCost: This algorithm gives access to several variants of full topology design problems. Offline_tcfa_generalMultilayer: Solves a general multilayer optimization problem formulation. Online_evProc_adaptiveRoutingPrimal: This module implements a distributed primal-gradient based algorithm, for iteratively adapting the network routing. Online_evProc_congestionControlPrimal: This module implements a distributed primal-gradient based algorithm using a barrier function, for adapting the demand injected traffic (congestion control) in the network, to maximize the network utility enforcing a fair allocation of the resources. Online_evProc_persistenceProbAdjustmentPrimal: This module implements a distributed primal-gradient based algorithm for adjusting the link persistence probabilities in a wireless network with a ALOHA-type random-access based MAC, to maximize the network utility enforcing a fair allocation of the resources. Online_evProc_powerAssignmentPrimal: This module implements a distributed primal-gradient based algorithm for adjusting the transmission power of the links in a wireless network subject to interferences, to maximize the network utility enforcing a fair allocation of the resources. Online_evProc_adaptiveRoutingDual: This module implements a distributed dual-gradient based algorithm, for iteratively adapting the network routing. Online_evProc_backpressureRoutingDual: This module implements a distributed dual-gradient based algorithm for adapting the network routing to the one which minimizes the average number of hops, that results in a purely decentralized backpressure scheme. Online_evProc_congestionControlDual: This module implements a distributed dual-gradient based algorithm, for adapting the demand injected traffic (congestion control) in the network, to maximize the network utility enforcing a fair allocation of the resources. Online_evProc_csmaBackoffOptimizationDual: This module implements a distributed dual-gradient based algorithm for adjusting the backoff windows sizes in a wireless network with a CSMA-mased MAC, to maximize the network utility enforcing a fair allocation of the resources. Online_evProc_congControlAndQoSTwoClassesPrimalDecomp: This module implements a distributed primal-decomposition-based gradient algorithm, for a coordinated adjustment of the congestion control of two types of demands (with different utility functions), and the fraction of each link capacity to grant to the traffic of each type, to maximize the network utility enforcing a fair allocation of the resources. Online_evProc_congControlAndTransmissionPowerAssignmentDualDecomp: This module implements a distributed dual-decomposition-based gradient algorithm, for a coordinated adjustment of the traffic to inject by each demand (congestion control), and the transmission power in each link of the underlying wireless network, to maximize the network utility enforcing a fair allocation of the resources. Online_evProc_congControlAndBackpressureRoutingDualDecomp: This module implements a distributed dual-decomposition-based gradient algorithm, for a coordinated adjustment of the traffic to inject by each demand (congestion control), and the routing (backpressure based) of this traffic in the network, to maximize the network utility enforcing a fair allocation of the resources. Online_evProc_multidomainRoutingPrimalDecomp: This module implements a distributed primal-decomposition-based gradient algorithm, for a coordinated adjustment of the routing in multiple domains (or cluster, or autonomous systems) in a network, so that domains do not need to exchange sensitive internal information, and minimize the average number of hops in the network. Offline_cfa_modularCapacitiesAndRoutingDualDecomposition: Finds the routing and mocular capacities for a network that minimize the cost, using a dual decomposition approach The time evolution of different metrics can be stored in output files, for later processing. Offline_fa_ospfWeightOptimization_localSearch: Searches for the OSPF link weights that minimize a measure of congestion, using a local-search heuristic The time evolution of different metrics can be stored in output files, for later processing. Offline_fa_ospfWeightOptimization_SAN: Searches for the OSPF link weights that minimize a measure of congestion, using a simulated annealing (SAN) heuristic The time evolution of different metrics can be stored in output files, for later processing. Offline_fa_ospfWeightOptimization_tabuSearch: Searches for the OSPF link weights that minimize a measure of congestion, using a tabu search heuristic The time evolution of different metrics can be stored in output files, for later processing. Offline_fa_ospfWeightOptimization_GRASP: Searches for the OSPF link weights that minimize a measure of congestion, using a GRASP heuristic The time evolution of different metrics can be stored in output files, for later processing. Offline_fa_ospfWeightOptimization_ACO: Searches for the OSPF link weights that minimize a measure of congestion, using an ant-colony optimization (ACO) heuristic. Offline_fa_ospfWeightOptimization_EA: Searches for the OSPF link weights that minimize a measure of congestion, using an evolutionary algorithm (genetic algorithm) heuristic The time evolution of different metrics can be stored in output files, for later processing. Offline_tcfa_wdmPhysicalDesign_graspAndILP: This algorithm is devoted to solve the several network planning problems in an optical WDM network (fiber placement, RWA, under different recovery schemes), appearing in the case study in the book section mentioned below.